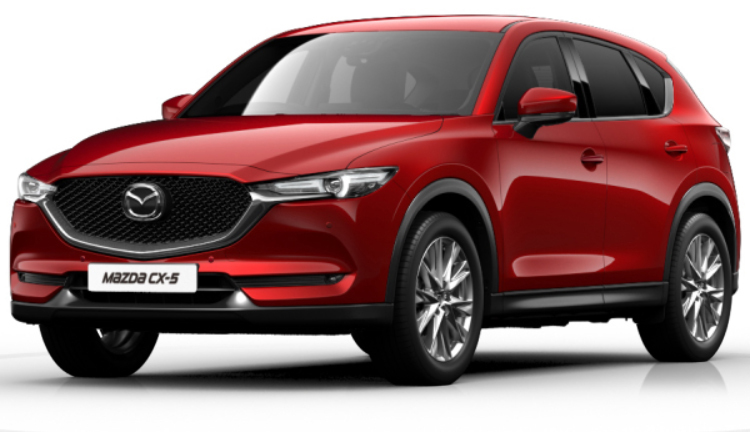 Read our customers' honest and impartial Mazda CX 5 car reviews and ratings to easily find your next car at Motorparks. Loads of space for the family and a huge boot. Great drive with loads of power when needed. Being the proud owner of a new CX-5, coloured in Soul Red Chrystal. The car looks great and is a lovely drive with a comfortable and smooth ride, despite the over abundance of pot holes currently in the Kent and Sussex roads. One small issue is that Mazda have not yet sourced a supply of touch up paint in this colour, something that I feel should have been addressed before launching a new colour - as I have unfortunately collected stone chips already and I am now getting concerned how long it will be before I can affect a repair. It's the second CX-5 I have had. Its just as comfortable and easy to drive as the last one now I have got used to the parking brake instead of the handbrake. The only thing different I have noticed is the chrome finish fitted around the door air vents reflects in the wing mirrors and is worse when it's sunny. Mazda probably should have left it as it was previously without the chrome surround. Wouldn't put me off buying another Mazda cars as they are the best I have driven and the customer service is the best. Very pleased with my Mazda CX-5. Very good to drive, quiet and comfortable. The AWD makes it feel very stable. Mazda CX 5 - Great family car, loaded with every extra. Peter at Doves Croydon was excellent. Comfort is good for long trips. Fuel is great - don't use much. All the extras on the car are helpful and I look forward to my long trips to and from Denmark where I work. I have only driven my new CX-5 Sport Nav Auto for a couple of hundred miles but I am enjoying the drive. Good driving position, good performance, good feeling of space inside. I think I am going to enjoy the vehicle a great deal. Irritations are, on a Sort version of this class, there should be gear paddles and an internal tail gate release. So far, and I stress I have not done a long journey yet, I am only averaging 33 MPG. Super car! We are on our second Mazda CX-5, absolutely delighted so far. Bring on the snow for a real test. I had been considering a CX-5 for many months but struggled to find the model I was after. The petrol model was perfect as I drive less than 10,000 miles a year now I'm retired. The SE-L Nav model gave me all the spec I needed and came on 17inch wheels - which I find gives a softer ride than the sport models which run on 19inch rims. So all in all I love the car and would recommend Mazda Tunbridge Wells to anyone considering this model of car. Nice, quiet and comfortable to drive. Hand brake does take some getting use to. Would be nice to have electric tail gate lift. Bought the car without ever being in one. A good decision. Drove it back home from Tunbridge Wells - 200 plus miles. Comfortable, quiet running, brilliant drive. Looks to be economical regarding fuel useage. So far so good. I would highly recommend this car to potential buyers. Excellent car, does exactly what I want. Plenty of room and the colour draws admiring looks, plus a great deal and service from supplying dealer Northampton Motors. Great car, enjoyable to drive and good spec. Good to look at both inside and out. Needs more petrol engine options though. I had owned a 2012 CX5 auto previously. The new car is a little different on the inside now with a push button handbrake. This took some getting used to, but I quite like this feature. The car should also have a brake hold in traffic so you don't have too keep your foot on the brake pedal. Apart from the centre console change there is not much change to the cabin. I liked the fact I could select from my touch screen whilst moving in my old car. This has been disabled and I now have to fumble around looking down to see the mouse knob or which button to press when selecting an action from the screen. I don't like this and feel it is more dangerous for the driver as you have to take your eyes away from the road further and for longer. The torque seems to be a better set up however I FEEL that like the last model Mazda are still missing a gear. This would improve the drive further and be more efficient. I did not like the fact the car comes as standard with a chemical tyre fix and it cost £400 for a space saver wheel - not even a full sized wheel, a space saver! I have had an experience with the chemical fix which still left me stranded. The suspension is still quite hard and you feel a lot of the road's imperfections, but there is not a lot of roll when cornering which I like. I thought the sports model came with active lights which move around the corners with you like my last car, however I don't seem to have this. This needs some further investigation. I did think the MPG would have been better, although there seems to be a little improvement from my last car before I had it performance mapped. After my mapping my last 2012 model averaged 35 MPG where as this 2017 averages 33 MPG - he extra gear gents. I need a boot tidy as I have lost hide away space due to the spare wheel. I have yet to check out a few of the controls. Home lights is set up very strange. Why this is not set up on auto light is a bit of a mind melt. VW have done this for years. Very happy with new car. I am enjoying driving it. Very comfortable, smooth ride. Performance of car brilliant. Overall, I am extremlely pleased with my new car. Thank You. Two months on from purchase and I've had to fill up the tank a few times and clean it. That's all. Everything else on the CX-5 has been faultless and I'm a very happy customer. Remarkable car. Powerful engine, amazing smooth automatic gear change. Quiet, comfortable, corners magnificently. Averages 46mpg for mixed motoring and I expect it to be higher on a long drive which I have not done yet. The best car I have ever had or driven. Quality car, well equipped, great Bose sound system - which I find a bit difficult to work out switching between CD and radio. TA interruption's annoying, seems to be if set 'on' that on it is actually off? Excellent car does everything I expected, economy is good for a petrol suv, best of all the wife likes driving it. Bought my Mazda CX-5 2 weeks ago and I love it. It was a step up from a crossover to a SUV, so I'm delighted with the size, handling, quality and spec of the car. Also very impressed with the service from Bolton Motor Park, this is the second car I've bought from them, and although they can be slow to return phone calls they always get there in the end. Very good choice only got some noises in the steering system. Mazda Garage is looking into this now. The CX-5 is a fabulous driving experience and the best car I have ever purchased. A real pleasure to drive. Comfortable, responsive, intuitive controls and all the gadgets I'll ever need. Looks very smart too.